Today's test system consists of the hardware listed below, and as with all good testing a clean install is used and the latest Windows Updates and manufacturer drivers are applied. The applications and games used in today's tests are the latest of what was available at the time of this analysis - links to demos and free trials are provided when applicable. 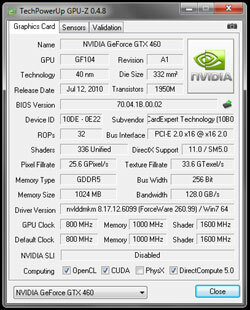 Gainward's GTX 460 GS GLH features a default core clock of 800 MHz, shader of 1600 MHz, and memory running at 1000 MHz (4000 MHz effective). Full specifications can be found here. 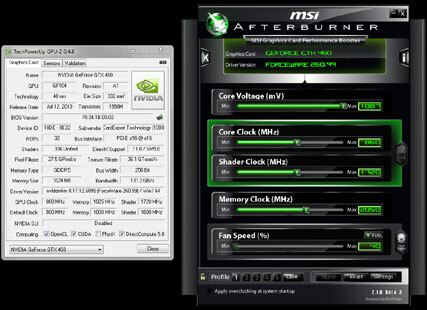 Overclocking allowed us to increase the core to 860 MHz, shader to 1720, and memory to 1025 MHz (4100 MHz effective) making full use of core voltage adjustments present in MSI's Afterburner software. Please note: PhysX is disabled for consistency between results. We have compiled a list of popular and graphically challenging games which include titles utilising Microsoft's DirectX 9, 10 and 11 API's for testing today; accompanied by 1920x1200 and 1680x1050 resolutions that are most commonly used by gamers based on Steam's hardware survey. A reference AMD Radeon HD 6870 and 5850 was thrown into the mix as they come in at similar price points, as well as two other GTX 460 variants. Gainward's GTX 460 GS GLH and overclock results are highlighted in blue. Score: Average Frames per Second (FPS) - Higher is Better.